Autism is one of the most common developmental disabilities (Barua & Daley, 2008). As many as 95% of children with autism have been reported to have sensory processing difficulties (Baker, Lane, Angley, & Young, 2008). Sensory processing disorder (SPD) is the inability of an individual to process certain information received through the senses (Sen et al., 2009). Many parents of children with autism spectrum disorder (ASD) use complementary and alternative medicine, since no single intervention has proved effective in alleviating ASD core symptoms (Radhakrishna, Nagarathna, & Nagendra, 2010). Hence, the present study was conducted with the aim to evaluate the effect of yoga therapy on the symptoms of SPD in autistic individuals. We studied the effect of 2 weeks of yoga therapy on 21 participants with ASD. Participants were students of two schools for special children located in the northern part of India. The age of the participants ranged from 6 to 20 years (mean ± standard deviation: 13.05 ± 4.50 years). Diagnosis of ASD was based on Childhood Autism Rating Scale. Autistic individuals with the history of having SPD; mild mental retardation; who were cooperative enough to do yoga and who had not practiced yoga in the past 6 months, before the commencement of the study were included in the study. Autistic individuals with the history of any other developmental disorder such as severe mental retardation, Down's syndrome, and Cerebral palsy were excluded from the study. Out of 21, 2 participants were excluded from the study due to lack of attendance and thus not included in the statistical analysis. A prior approval from the principal of the school and guardians of the participants was obtained. The intervention was based on Integrated Approach of Yoga Therapy (IAYT) (Radhakrishna et al., 2010). All the participants received IAYT for the duration of 90 min a day for 5 days a week for the period of 2 weeks [the details of the intervention are given in [Table 1]. The participants were assessed using Autism Treatment Evaluation Checklist (Magiati, Moss, Yates, Charman, & Howlin, 2011) and Sensory Assessment Checklist (SAC) (Autism Education Trust, n.d.). All the data were checked for normality using Kolmogorov–Smirnov test. Analysis was performed using paired sample t-test with the use of Statistical Package for the Social Sciences, Version 16 (SPSS Inc., Chicago, Illinois, USA). 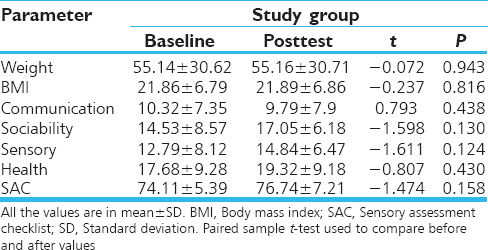 While the assessments showed no significant changes in any of the variables such as weight, body mass index, communication, sociability, sensory, health and SAC scores compared to its baseline [Table 2], the parents of the participants reported decline in aggression, increase in calmness, and improved behavior of the participants. Furthermore, the teachers and the yoga instructor reported an increase in response to verbal instructions given in the classroom. Thus, after 2 weeks, we found some improvement in behavior of the participants, which suggests that there are some benefits to be had from yoga therapy. Definite conclusions would be possible with a larger number of participants and a longer intervention time, but the need for long-term follow-up makes such a study difficult to organize. Autism Education Trust. Sensory Assessment Checklist. Retrieved January 12th, 2018, from http://www.aettraininghubs.org.uk/wp-content/uploads/2012/05/37.2-Sensoryassessment-checklist.pdf. Baker, A. E., Lane, A., Angley, M. T., & Young, R. L. (2008). The relationship between sensory processing patterns and behavioural responsiveness in autistic disorder: A pilot study. Journal of Autism and Developmental Disorders, 38 (5), 867-875. Barua, M., & Daley, T. C. (2008). Autistic Spectrum Disorders: A Guide for Paediatricians in India. New Delhi, India: AAHAN Publications Division of the National Centre for Autism Action for Autism. Magiati, I., Moss, J., Yates, R., Charman, T., & Howlin, P. (2011). Is the autism treatment evaluation checklist a useful tool for monitoring progress in children with autism spectrum disorders?. Journal of Intellectual Disability Research, 55 (3), 302-312. Radhakrishna, S., Nagarathna, R., & Nagendra, H. R. (2010). Integrated approach to yoga therapy and autism spectrum disorders. Journal of Ayurveda and Integrative Medicine, 1 (2), 120-124. Sen, D. A., Indu, C., Rashmi, D., Basu, I. M., Merry, B., & Viniti, P. (2009). DSE (ASD) MANUAL Therapeutics. New Delhi, India: Rehabilitation Council of India in Association with Kanishka Publishers.